Denny adds new material to his library regularly so there's always something new and exciting to learn. For 2015 he's expanding his library to over 150 hours of streaming lessons with over 10,000 Easy Play tabs and 100's of his patented guitar arrangements making this the largest guitar lesson library in the world. Here is what you'll receive when you enter the Library today , 2019. Denny has spent over 60 years playing and in that time he has developed a guitar chord library which incorporates full color pictures and an easy to use finger diagram that will give you instant access to every guitar chord that can be played on the guitar. This will show you exactly how to form each chord and exactly where to put your fingers on the strings. As a Zager Guitar Student you will have lifetime access to this part of the library even if you decide to end your membership. Denny is always adding new parts to his library and this part should be completed summer of 2019. Lifetime Membership to the Zager Guitar Chord Library Denny has spent over 60 years playing and in that time he has developed a guitar chord library which incorporates full color pictures and an easy to use finger diagram that will give you instant access to every guitar chord that can be played on the guitar. This will show you exactly how to form each chord and exactly where to put your fingers on the strings. This part of the library will focus on players who are interested in writing and arranging their own music. Denny will show you a system that he has used for over 4 decades. Have you always wanted to learn fingerstyle but when you tried found it so complicated that you went back to strumming or using a pick? If this describes you then this part of the library is for you. We set up multiple video cameras with extra sensitive parabolic microphones in Denny's personal recording studio that make you feel as if you're right there taking a guitar lesson with Denny. In these full length feature films Denny guides you finger-by-finger, string-by-string, just as if you were in his studio, and shows you how to take your guitar skills to new levels using all the secrets he has learned from playing, teaching, and performing for over 60 years. Many students say that the knowledge they gained in only one lesson with Denny made such a dramatic impact on their abilities that it allowed them to make advances that years of previous instruction were never able to achieve. This is an incredible bargain considering Denny teaches only a handful of students annually at $200 per hour. Denny will be adding new video guitar lessons to his online video library all year long throughout 2019. This easy to use manual will show you how to use Denny's revolutionary "Play-By-Ear" guitar system by showing you how to play a complete guitar arrangement right away, not reciting endless hours of notes and scales. This makes learning exciting because at the end of your practice session you have an entire composition that you can play for anyone. This is the same easy to use manuscript that has shown thousands of people how to play the guitar quickly and painlessly. Denny even put together a special video (for those who don't like reading) where he skips through the pages and shows you the key things you need to know to start playing right away. Zager EZ-Play Guitar Tabs are fully downloadable and printable color guides written in the "Zager Guitar Language" that provide you with the basic chords and hand movements to play any song you desire. If you compare Zager EZ-Play tabs with other guitar tabs you will notice Zager tabs are much easier to use because they contain full color pictures that show you exactly where to put your fingers and what your hands should look like when playing. Zager EZ-Play tabs also incorporate lyrics, verses and bridges whenever possible which make your finished arrangements sound that much better. Denny will be adding new EZ-Play Guitar Tabs to his online video library all year long throughout 2019. 1700+ Fully Illustrated EZ-Play Guitar Tabs Zager EZ-Play Guitar Tabs are fully downloadable and printable color guides written in the "Zager Guitar Language" that provide you with the basic chords and hand movements to play any song you desire. These guitar demonstrations will allow you to see and hear Denny play in real time with close up slow speed video of his left hand, right hand, and also a simultaneous two handed view so you can see every one of Denny's fingers from every possible angle. You can also pause, rewind and play these videos over again until you get the movements down on your own. Denny will be adding new video guitar demonstrations to his online video library all year long throughout 2019. 270+ Close Up Slow Speed Audio/Video Guitar Demonstrations These guitar demonstrations will allow you to see and hear Denny play in real time with close up slow speed video of his left hand, right hand, and also a simultaneous two handed view so you can see every one of Denny's fingers from every possible angle. You can also pause, rewind and play these videos over again until you get the movements down on your own. The goal of the Zager System is to get you to what Denny calls the "reflex stage," where you are playing guitar on a subconscious level. You're moving your fingers and sounding like a pro...you just don't know how you're doing it! You may think this is impossible, but after 40 years of teaching and seeing thousands of students attain this level, it happens at a much faster rate than you expect. Many students say that learning to play a song from a Zager Guitar Video Package makes learning songs from regular tabs totally obsolete. The Zager Guitar Library currently has enough video packages to last most players 4-6 years. Denny will be adding new song arrangement video packages to his online video library all year long throughout 2019. 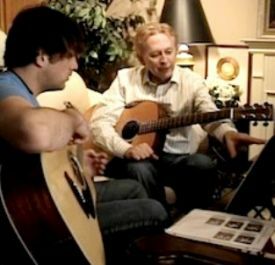 Many players find that Mr. Zager's collection of pre-recorded guitar lessons that he has given to private students one of the best learning tools of the entire library. These are the exact guitar lessons that students pay $200 per hour for. Denny's research has shown that the majority of people tend to ask the same questions about many of the same topics. These videos will provide you with the valuable feedback that's generated from having a student present asking questions. If Denny happens to be working on a specific musical piece you will also receive the full color PDF download for that particular song. This is really a tremendous bargain considering all of the valuable knowledge that you will gain from these lessons, only at a fraction of the price. Denny will be adding new in studio videotaped guitar lessons to his online video library all year long throughout 2019. Not only is Denny a world-class musician, he is also a professional guitar luthier. A guitar luthier is a person who builds and modifies guitars from scratch. This additional expertise will save you countless hours of frustration, and possibly a damaged instrument. It's virtually impossible to place a dollar value on what this amount of information is worth, simply because so few people have it. Denny will be adding new guitar tuning & adjustment videos to his online video library all year long throughout 2019. If you would like to try Zager Guitar, Denny insists that you do so entirely at his risk. That's why we offer a true no risk 100% unconditional money-back guarantee. Unlike all other guitar courses out there who are trying to make a quick buck Denny's program is different for one reason....Denny's not in it for the money. Denny's already had fame and fortune many times over...this is not what it's about. Denny simply loves music and he loves teaching others how to make music, and he wants to leave a legacy that students can use for forever. You can see this the minute you you take your first lesson from him. Go try all the other guitar courses out there and compare, but try not to get taken by the fine print offers that only provide a partial refund or worse yet no refund at all. Zager Guitar has never done business this way and will never do business this way and it's for this reason we have one of the largest followings out there and never have to advertise...our students advertise for us. Download and print the manuals (those are yours to keep forever) and use the videos for as long as you like. If for any reason you aren't completely satisfied simply let us know and we'll refund 100% of your payment no questions asked. In this way you have absolutely nothing to lose and everything to gain. Denny would have it no other way. When you click "Submit" you'll receive instant access to the entire Zager Guitar lesson library (over 45 years of work) with new material added regularly. We're a family owned company who treats its customers like family so if you're not satisfied you get your money back no questions asked.